‘The Seventh Gate (Acient Relics F12)’? Well, it only works in 7 of the stories, and some of those may not be ideal plays at any given time. It also has to be night, which isn't that common for Misk. And you have to leave a domain open, ready, and have won the arcane struggle (or have some other way to stand Twila), forgoing the ability to stand a more potent character off of it. Very restrictive, to say the least. However, getting The second Dragon or Chaos Unleashed off at the right time can be game-winning. And how many people are going to commit against TKP at the 9th Plague, unless they are certain they will win terror/combat? Overall I feel its a card to experiment with, but not one that will reliably do well in a deck. Trouble is with the nigh restriction you can't just put 1x in for the lolz, you have to build around her to a degree. I want to like this card a lot, I can't though. A card that cannot trigger her own ability without being part of a 3 card combo. Only being usable in a MU night deck with standing effects makes this a bad card, especially when it only works against certain stories when you have an open domain. It's an ability you can never rely on and her cost, icons and subtypes won't win her a place in a deck. It's a really powerful ability and was unique when first released but since then there have been easier ways to trigger stories added to the card pool. If you're looking to trigger story abilities without winning them, your main man should be Ardois-Bennot. Twila just has too many restrictions to be very workable: it has to be Night, you have to commit her, you have to then find a way to ready her (likely through the Arcane struggle you're likely to win), and then you have to exhaust her and pay 2. That's a lot of hoops to jump through for the effect. It's a good one, but not really worth the effort. She does have some pretty sweet synergy with Dream Diary though, since you can just commit-and-trigger rather than waiting for the Arcane struggle--or you could even manage to trigger it twice. 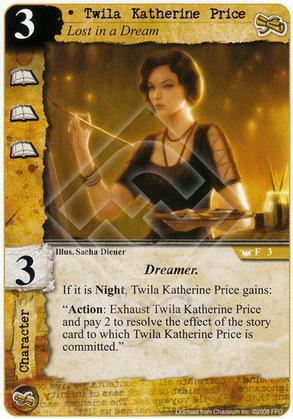 Does the ability of Twila Katherine Price (Dreamlands F3) work with Conspiracy cards? What about conspiracy cards that specifically have the requirement of winning them or having a character from a particular faction? Twila Katherine Price does work on conspiracy cards since once played they are treated as story cards, but her ability does not alter the effect of the triggered story card or conspiracy in any way. If the effect requires you to meet a condition that you do not meet and therefor are unable to successfully resolve that effect her ability cannot be triggered.